Reserve your seat now for Light Within the Cracks! 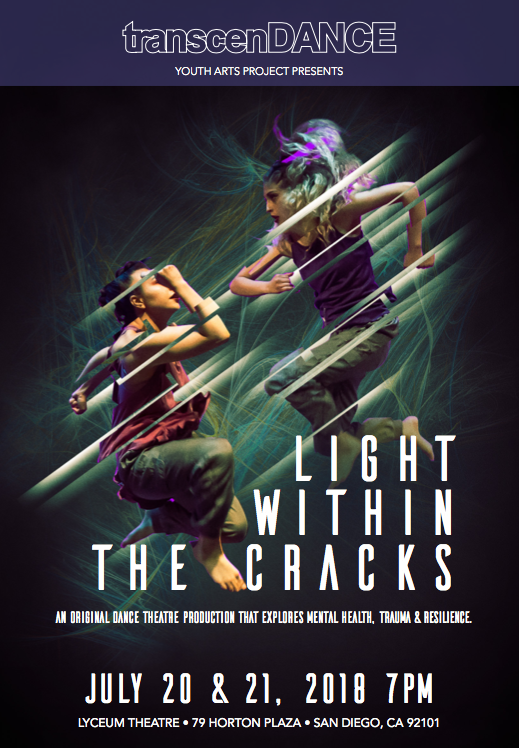 transcenDANCE Youth Arts Project, proudly presents Light Within the Cracks, a dance theatre production with live music, spoken word, video, and original dance pieces that explores mental health, trauma, and resilience. Light Within the Cracks is the culminating event of a 5-month long program for San Diego teens that combines technical dance and movement training with reflection on society and self. The performance will give us dynamic images of struggle, resilience, and hope that honor and celebrate our teen and young adult performers. Light Within the Cracks lifts the cloud of silence on mental health struggles, including anxiety and depression, by looking at their relationship to issues such as sexual trauma, mixed immigration status, technological “numbing,” and socially-constructed identities. Alongside the exploration of trauma and struggle is the celebration of the resilience of the human spirit, especially when we are in a community of mutual respect, love, and support. A VIP celebration for Light Within the Cracks will be held at 5:15pm Saturday night in the Lyceum Theatre lobby and will include food, drinks, alumni meet & greet, live music, and a silent auction. VIP tickets include the reception and VIP seating for the performance at 7pm. We hope to see you there!